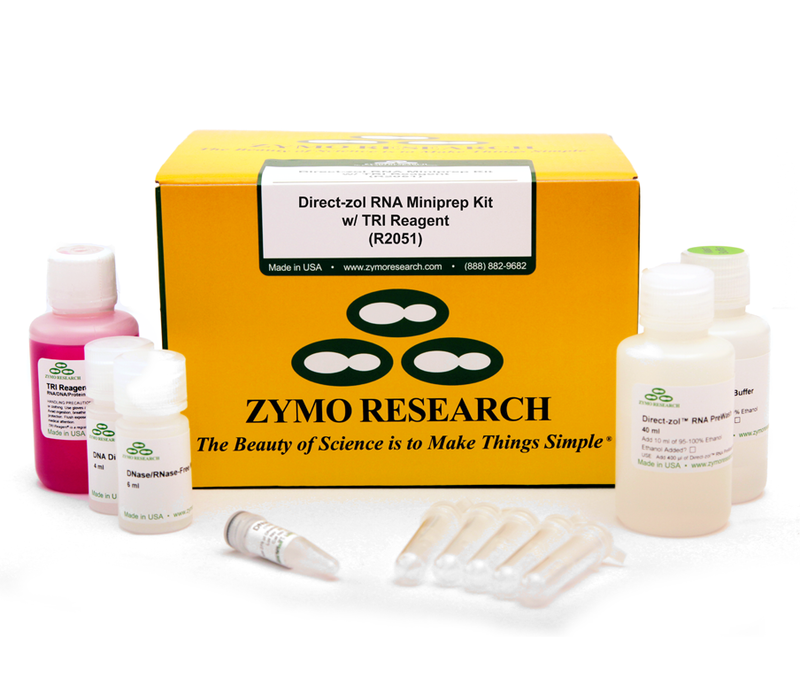 DNA/RNA extraction sample kits from Zymo Research | BaseClear B.V.
DNA/RNA extraction and epigenetics sample kits of several of the most popular Zymo Research products are available for your evaluation. Below is a list of our current offerings. To order your free sample kit, please fill in the sample kit request form below on this page. You will receive the requested test kits for evaluation without any obligations. N.B. BaseClear can only offer sample kits to customers in The Netherlands, Belgium and Luxembourg. Please visit http://www.zymoresearch.com/distributors to find the distributors for other countries. The fastest method for complete bisulfite conversion of DNA for methylation analysis. Pre-made conversion reagent facilitates rapid scale up for high-throughput and automated applications. Unlike other agarose gel extraction kits that yields 20-40% DNA, the Zymoclean kit can be used to boost gel DNA recoveries to >80%. The DCC™ is for rapid cleanup of DNA from any enzymatic reaction. The unique spin column facilitates microelution of DNA in ≥6µl. The Genomic DCC™ is for the quick (5 minute) recovery of ultra-pure, large-sized DNA (e.g., genomic, mitochondrial, plasmid (BAC/PAC), viral, phage, (wga) DNA, etc.) from any enzymatic reaction or impure preparation (e.g., Proteinase K digestion). 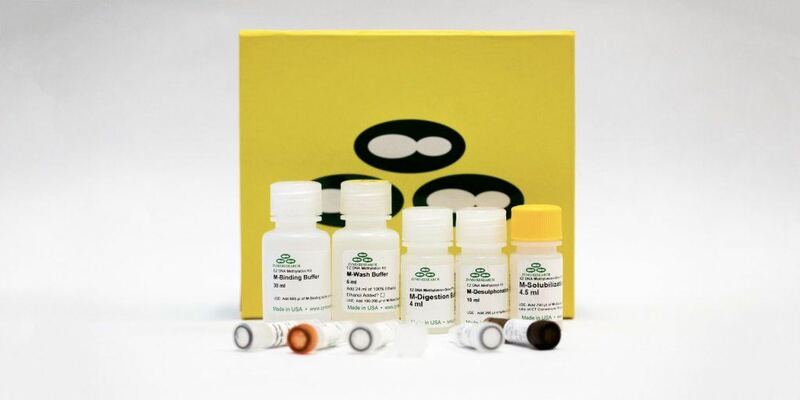 The Select-a-Size DCC™ provides the quickest and easiest method for purifying a desired range of DNA fragment sizes from library preps, PCR, endonuclease digestions, ligations, etc. One step, complete removal of polyphenolic PCR inhibitors from impure DNA/RNA preparations. The Zyppy can be used for isolation of transfection-quality plasmid DNA directly from culture without the need to spin down the bacterial cells… its pellet free! 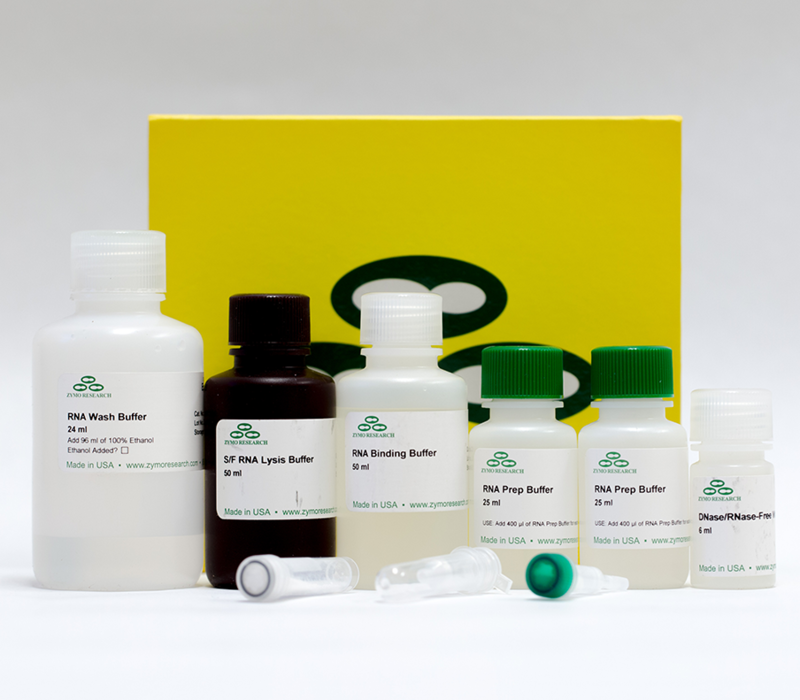 The Quick-DNA™ Universal Kit is the easiest method for high yield total DNA extraction (e.g., genomic, plasmid, mitochondrial, viral) from any biological fluid, cell culture, or solid tissue sample. Innovative reagents and Zymo-Spin™ Column technologies allow for ultra-pure and concentrated genomic DNA ˃ 50 kb to be eluted in as little as 35 µl. ZymoPURE™ Plasmid Isolation kits provide the fastest and simplest method available to efficiently isolate transfection quality plasmid DNA from E. coli. The ZymoPURE™ Plasmid Maxiprep kit features a spin column-based method for the purification of up to 1.2 mg of high-quality plasmid DNA in less than 18 minutes. The eluted plasmid DNA is ready for immediate use, avoiding the need for subsequent precipitation steps. Fast and reliable purification of up to 100 µg of transfection-grade plasmid DNA using a spin-columnInnovative ZymoPURE™ technology enables elution of ultra-pure endotoxin-free plasmid DNA in as little as 25 µl. Rapid, robust, and simple purification of high quality, inhibitor-free DNA from any sample including feces, soil, water, biofilms, swabs, saliva, body fluids, etc. ZymoBIOMICS™ innovative lysis system enables efficient and unbiased lysis of microbes including Gram-positive and negative bacteria, fungus, protozoans, algae, and viruses. 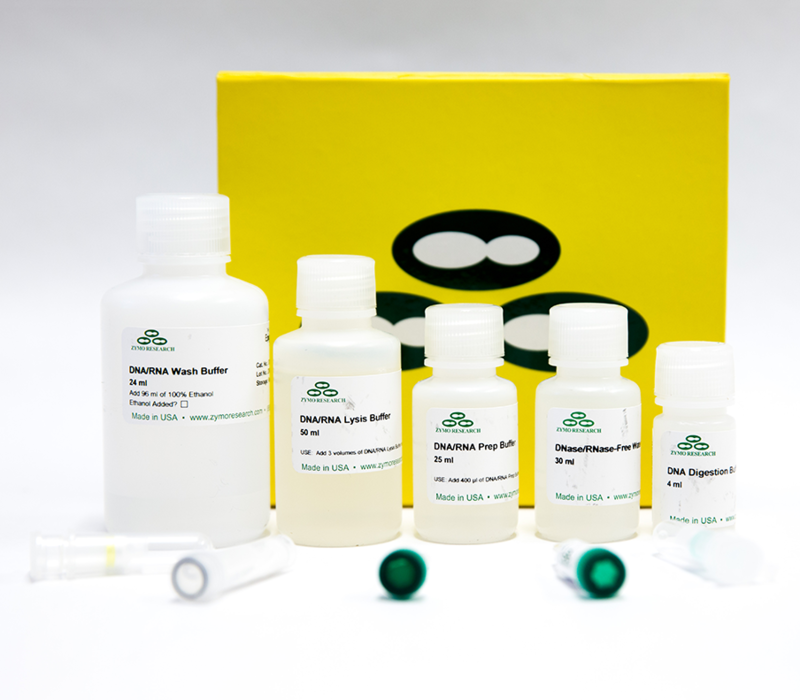 Unbiased extraction of ultra-pure DNA makes the ZymoBIOMICS™ DNA Mini Kit ideal for 16S rRNA gene sequencing, shotgun metagenomic sequencing, arrays, PCR and other sensitive applications. Quick, easy isolation of small and large RNAs from a variety of cells and soft tissue samples in 10 minutes. DNase I provided for convenient in-column digestion. Preserves genetic integrity and expression profiles of samples (cells, tissues, blood, plasma, serum, saliva, urine, feces etc.) at ambient temperatures. DNA and RNA can be isolated directly without precipitation or reagent removal (compatible with most DNA and RNA purification kits). Inactivates infectious agents (virus). For general cloning, blue-white screening, plasmid isolation. Mix & Go transformation procedure with transformation efficiencies of 108 – 109 transformants/µg of plasmid DNA. Simple procedure: add DNA and then spread. DNA transformation in as little as 20 seconds!